In 1999, when he appeared on “The Late Show with David Letterman” to lay odds on whether the host’s jokes would solicit laughs from the studio audience, Vinny Magliulo stood where Elvis Presley and The Beatles and Victor the Ice Cream-Eating Bear had at the Ed Sullivan Theater. On Friday afternoon, the local sports oddsmaker shared center stage with another legend. 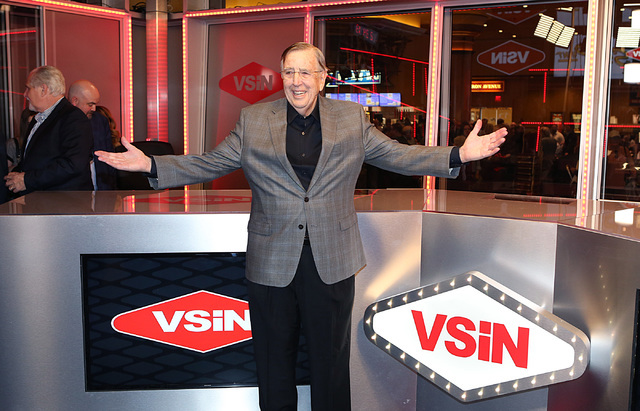 He was sitting alongside recently retired sports broadcaster Brent Musburger at the South Point ribbon cutting for VSiN (Vegas Stats & Information Network), a new multiplatform network dedicated to sports gambling. 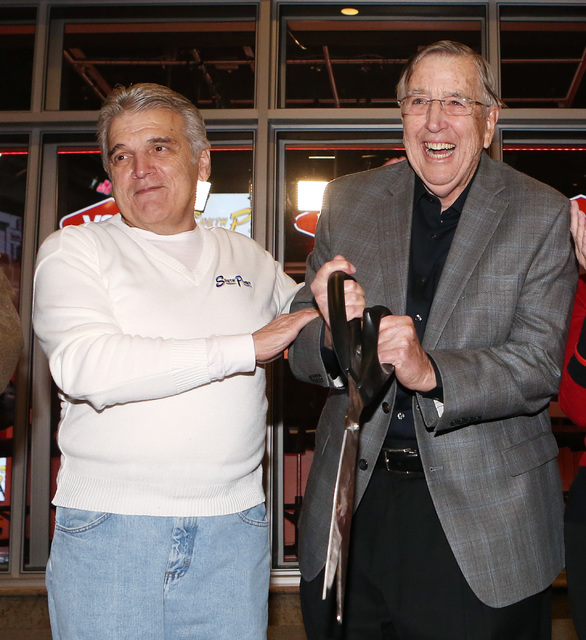 Musburger, who assumed the role of VSiN front man as of the final buzzer of Tuesday night’s Georgia vs. Kentucky basketball game on ESPN, rode in on a carriage drawn by the magnificent Budweiser Clydesdales. 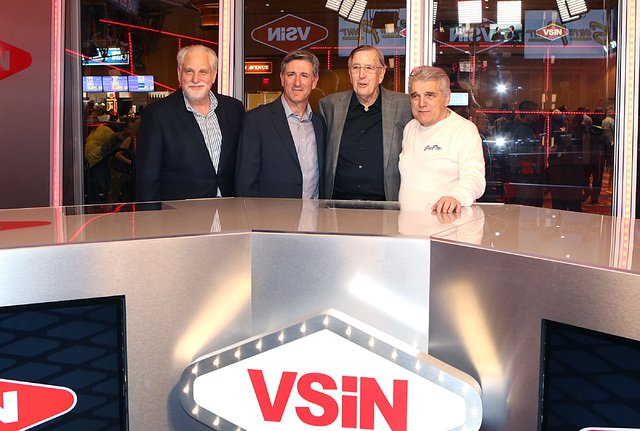 Other VSiN principals — Musburger’s “Friends in the Desert” including Las Vegas boxing analyst Al Bernstein and Magliulo’s fellow oddsmakers Jimmy Vaccaro and Chris Andrews — simply walked in with a throng of curious onlookers. 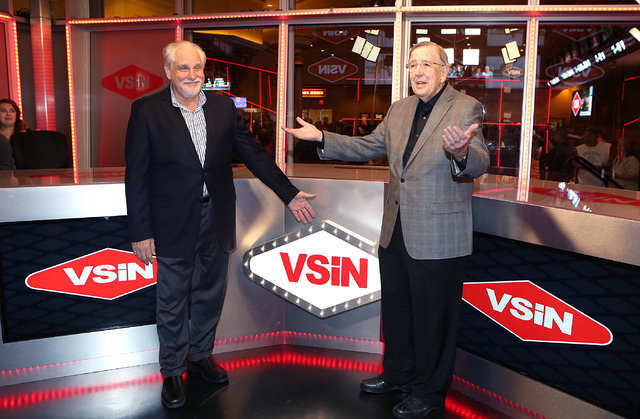 Magliulo, the former race and sports director at Caesars Palace, said VSiN was an idea 30 years in the making. It was kind of his idea, and to see the new broadcast studio adjacent to the South Point race and sports book come to fruition ranked right up there with his stint on late-night TV, and receiving a plug from retired four-star general Colin Powell, one of Dave’s guests that night. “We were hosting the Leonard-Hagler fight at Caesars Palace, working with Al Bernstein, doing a lot of interviews and things. And it occurred to me with all the media coverage on the property, it was as much about the property as it was about the event,” Magliulo recalled. “So I thought, why don’t we try to put together a show based in the sports book? Calendar pages flew by as they do in old movies to represent the passage of time. And then sports betting gradually and inexorably went mainstream. 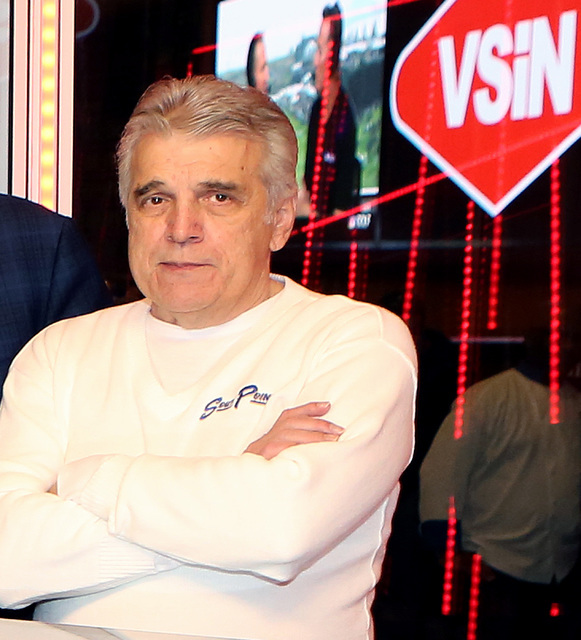 There was a meeting between Brian Musburger, Brent’s nephew, and Magliulo and Vaccaro, during which the vision of an around-the-clock sports wagering network was shared. Gaming executive John Gaughan agreed it was a good idea, and that he knew a guy in the hotel-casino business. That led to another meeting, between the fast-talking bookmakers and South Point owner Michael Gaughan. “He looked up at us over his glasses, shook his head and said, ‘What are you two up to now?’ ” Magliulo said. Molly Sullivan, the Philadelphia 76ers’ sideline reporter who swam many lengths of the swimming pool at Green Valley High and North Carolina, has written an excellent piece for a CSN Philly website project called “Tomboy” (with a slash through Tomboy), about women succeeding in the male-dominated world of pro sports. Her primary goal: Try not to make viewers hit the mute button, which she saw her father, Tom, do time and again to other sideline reporters. John McDowell, a longtime Las Vegas resident who played football for Vince Lombardi’s Packers during the 1960s, will sign autographs at the Rum Runner Lounge, 1801 E. Tropicana Ave., before, during and after the Super Bowl. McDowell briefly played on the Green Bay offensive line. Although not nearly as well known as Forrest Gregg or Jerry Kramer, I’m told he has plenty of stories to share about them. It has been a big week for the Thursday Lunch Bunch at Main Street Station. Jerry Izenberg, 86 years young and one of only two sports journalists to cover every Super Bowl, is in Houston reporting on the Patriots and Falcons (and other Super things he finds) for the Star-Ledger of New Jersey, and Riley Wallace, Hawaii’s all-time winningest basketball coach (and uncle of former UNLV sharpshooter Kendall Wallace), told the group he’ll be inducted into the Rainbow Warriors’ Circle of Honor on Feb. 25. The offseason weddings of Las Vegas baseball stars Kris Bryant and Bryce Harper and NASCAR stalwart Kurt Busch garnered many headlines. But if you’re scoring at home, pitcher Aaron Blair of the Atlanta Braves, by way of Spring Valley High School, also recently tied the knot — on the same day as Bryant. Dan Jaffe, an assistant baseball coach at College of Southern Nevada, attended both ends of the blissful Bryant-Blair doubleheader and said both lived up to that description. WHAT: Vegas Stats & Information Network, a startup multi-platform media network dedicated to sports wagering information and analysis. WHERE: South Point. 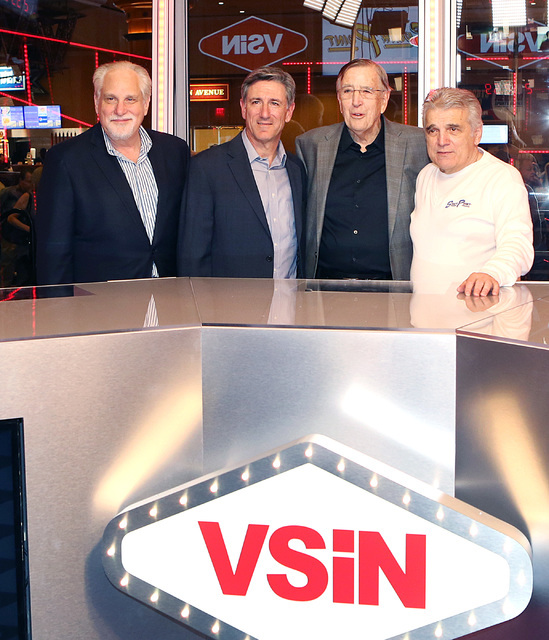 The VSiN studio is adjacent to the race and sports book on the main casino floor. 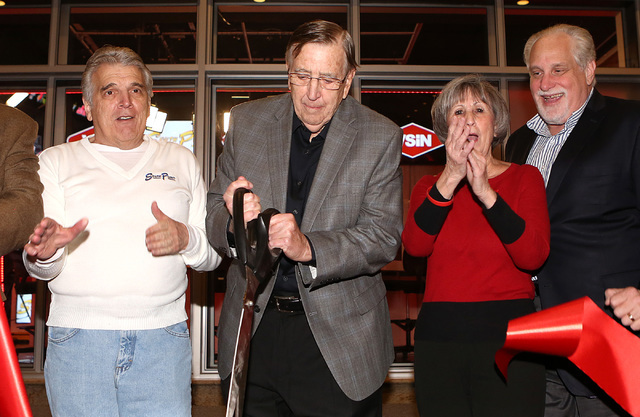 FOUNDER AND CHAIRMAN: Broadcast legend Brent Musburger. Other on-air personalities include Hall of Fame boxing announcer Al Bernstein, noted oddsmakers Jimmy Vaccaro and Vinny Magliulo, and an editorial team including former Review-Journal reporters Norm Clarke and Matt Youmans. LAUNCH: Musburger will host a special broadcast leading into Super Bowl LI starting at noon Sunday on Sirius XM Rush (Channel 93). The web, live streaming, radio, mobile and social media programming functions will launch full time Feb. 27. Content will air on SiriusXM Radio Channels 215 (Sirius) and 204 (XM).